This reports confirms that among all IoT connectivity technologies, LPWAN is the fastest-growing technology (109% CAGR and 1.15B connected devices expected by 2023). LoRa is identified as the most flexible LPWAN technology: leveraging its Spread Spectrum technique, it can deliver three different communication types depending on the desired volume and frequency of transmissions, and adaptive data rates. It also can be deployed both as a public and private network. LoRa currently has the widest ecosystem among all LPWAN technologies and is ideal for a wide range of low-power-consumption IoT applications, such as most applications within the agriculture and smart city segments. 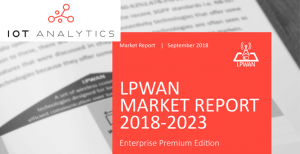 The market for LPWANs will start to shift from an Early Adopters Phase (present-2019/2020) to a Market Lift-Off Phase (2019/2020-2022/2023). That phase is likely to see accelerated adoption as the technologies find consolidation and end-users are clear about costs and benefits of each of them. Congrats Eugenio Pasqua for this very interesting report! More information at https://bit.ly/2Oz1oLu.